I have a new Happy Place: the boy next door with his drum kit wore out my old one. Now when I need a mental escape I picture myself back on the shaded bench at the end of a boardwalk that leads out into a lake. 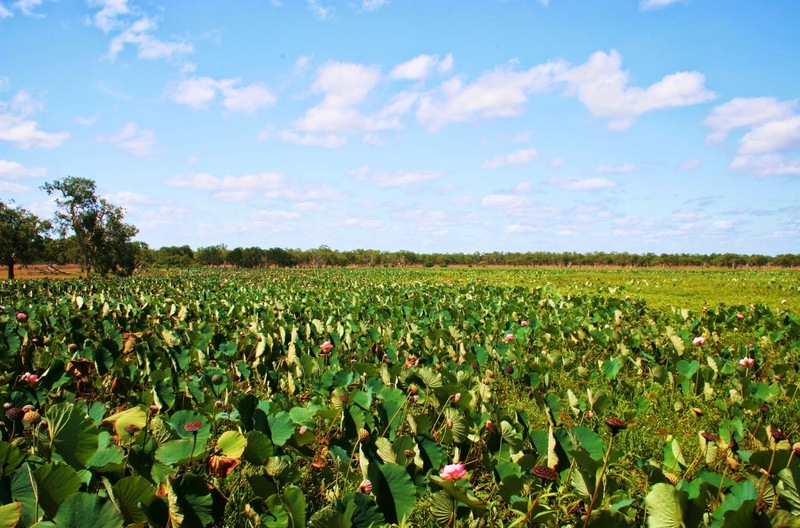 The water’s invisible beneath clustered lotus plants and when a warm breeze passes over, the stiff leaves rattle together and the perfect waxy flowers dip briefly before facing the sun again, their stamens bright yellow against the pink petals. I watch the breeze move away through the leaves to the far bank where the gum trees are white against the blue sky, and again there’s a perfect silence that I know stretches for a hundred empty kilometres in every direction. Under the little roof there’s just me and one green lizard. I don’t know about him, but I’m at peace with the world. Dog’s balls are remarkably tasty. Small and wrinkly, I would have passed them right by if Tyrone hadn’t pointed out the twin berries almost hidden by leaves. That’s why it’s good to walk through the bush with an Aboriginal — also because innocuous-looking things can be deadly, or at least very inconvenient. “That’s bush chewing gum,” he said, pointing to oozing sap. “No matter how fast you run, you won’t make it in time,” he added meaningfully. Crushed green ant nests make a soothing tea for sore throats, billy goat plums are delicious, sandpaper leaves are good for preparing didgeridoos, not so suitable as toilet paper. By the time we got to the river, we weren’t touching anything, but we fell with real enjoyment on Tyrone’s plates of crocodile sausage with rosella flowers, and smoked kangaroo with quandongs, appetites sharp after swimming across the plunge pool to sit under a rainbow. The clock over the bar in the Top Pub has no hands: that’s Thursday Island in a nutshell. The streets are empty, the ripe mangoes lie where they fall on the footpaths, fruitbats hang undisturbed in the trees. But things have been livelier here. In the cemetery are Japanese graves, pearl divers who went too deep, too often — a high price to pay for a mother-of-pearl button. In the quiet church a stained glass window records shipwrecks and rescues. 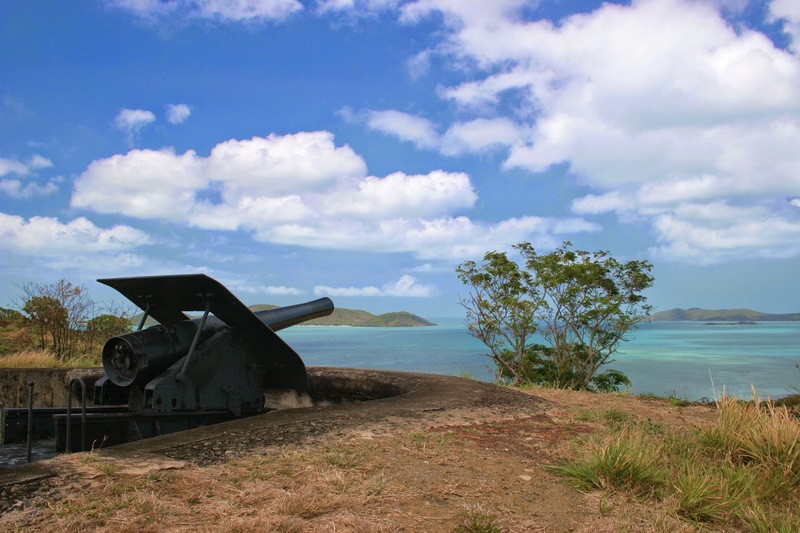 Up on Green Hill a fort with big guns is testament to a fear of invasion that led to evacuation of the entire island in 1941. By the jetty is a large sign warning of saltwater crocodiles, a constant threat to islanders tormented by hot sun and warm turquoise seas. I sit safe on the beach and watch two burly workers take a cautious dip. Nothing happens. It’s Thursday Island.